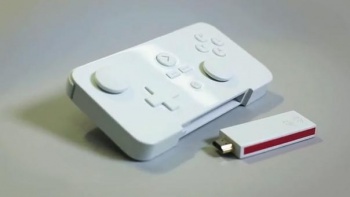 The GameStick developers' kits will ship soon after GDC 2013. GameStick, the mobile console that spectacularly conquered Kickstarter earlier this year - earning 648% of its funding goal - is now a reality. But if you want to see it, you'll need to be at GDC 2013, where PlayJam intends to debut its little console that could. "The demonstration will provide attendees with a first look at the GameStick User Interface," says PlayJam in a press release, adding that the display will also show off the "controller and some 30 titles due to form part of the initial line-up." Developer kits will be on their way out the door to Kickstarter backers soon after GDC shuts down. PlayJam's CEO, Jasper Smith, will also show his face at The Future of Mobile Gaming panel, on Thursday 28th March. The GameStick, for those of you who somehow missed the Kickstarter is a mobile console on a stick, intended to plug straight into the HDMI slot of your TV. It's Android operated, and will cloud store its games; the intent is to create a plug-and-play for mobile titles, or "big screen gaming without the clutter," as its website has it.